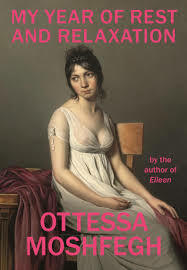 My Year of Rest and Relaxation (Jonathan Cape Penguin Random House 2018) is by Ottessa Moshfegh, the author of the dark novel Eileen, which I absolutely loved. My Year of Rest and Relaxation is similarly dark – blackly funny, keenly observed and introspective. This novel is a solipsistic and wistful examination of self; a contemplative discourse on grief; a social comment on the purpose of art; an inward-looking, esoteric, stream-of-consciousness meandering about the meaning of life. I suspect this is a cult-like tome for young people struggling to orientate themselves in the many hypocrisies of the modern world.